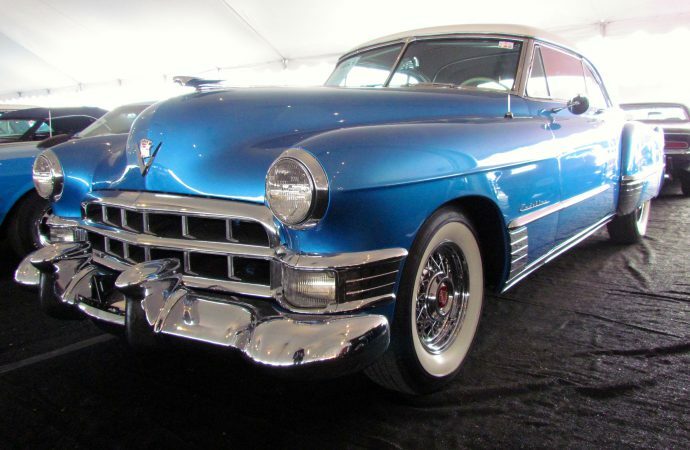 It’s one thing to see classic cars in auction catalogs, be they printed or online, to read the various auction-house descriptions, even to write the series of auction previews. It’s one thing to see classic cars in auction catalogs, be they printed or online, to read the various auction-house descriptions, even to write the series of auction previews we shared with you last week. But it’s quite another thing to actually go to the auction venues, to see and to walk among those cars in person. But that’s what we’re doing in the early days of Arizona Auction Week. For example, Monday, our newest staffer, Nicole James, and I spent much of the day doing a lap at Barrett-Jackson. Tomorrow, I plan to go to Bonhams. Wednesday, Bob Golfen is to visit RM and Gooding & Company and I’m planning to head to Russo and Steele and to Silver, with Nicole joining either Bob or me. At each of those visits, what we plan to do is wander through the cars, cameras in hand, and to share with you the six to nine (or maybe even more) cars that we’d most like to take home with us. This is a very personal process, dependent on very personal moods and tastes. But, hey, isn’t that the way it is with classic cars: You like Ferraris. He likes cars from the ‘50s and ‘60s. She likes European sports cars. I like affordable classics. Oh, and I’ll admit that what may have caught my eye a year ago, I barely may have noticed today as I was attracted to that bright and shiny thing over there. 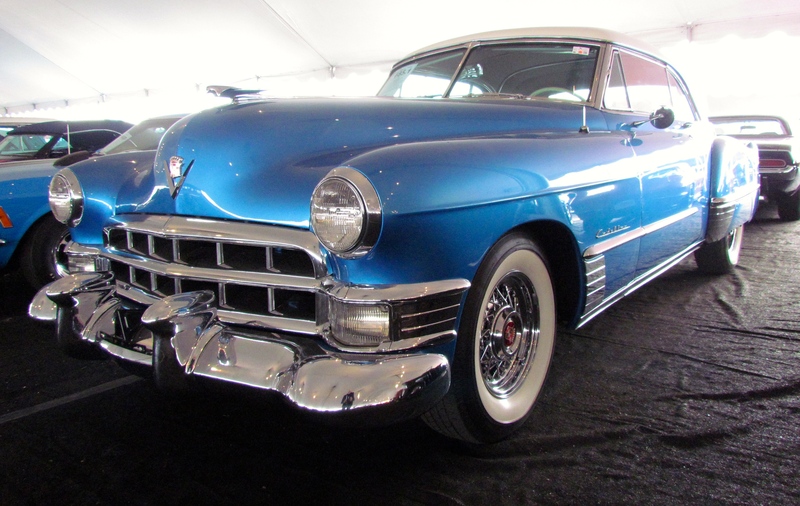 I’d have laughed if you told me Monday when I arrived at Barrett-Jackson that one of the cars that would draw me in would be a 1949 Cadillac. But then I saw this Bahama Blue and white beauty (Lot 685.1) with its blue-cloth and Oyster Gray-leather interior and it was love at first sight. Maybe I’m jealous of Rick DeBruhl’s Isetta but I kept circling various micro machines Monday. There was a 1967 Fiat 500, a 1960 BMW 600 Limo, a 1960 Fiat Multipla Model 600 with three rows of seats squeezed inside, but could any of them be as much fun as this (Lot 1221) 1965 Autobianchi convertible? Before he won the Indy 500 (which he did twice), my friend (name-dropping alert!) Gordon Johncock was among the drivers of the Weinberger Homes sprint car, which in 1964 he drove around Indiana’s famed Winchester Speedway in just 17.18 seconds, a record that stood for five years! The car (Lot 2083) now is coming out of the Pratte collection. Speaking of Indiana, that’s what it says on the badges of this 1935 White Custom Bus (Lot 505). The Indiana Motor Coach bodywork has five doors and a canvas top that opens above the passengers, who sit in an oak-lined interior. Why would I want it? The grandkids would love it, plus I could drive in every parade in every town. I admit it: I don’t think I’d ever seen a ’51 Nash Country Club 2-door coupe before, and I actually didn’t really see this one (Lot 630) because it was still wrapped in plastic to keep it clean before it crosses the block. But the proportions and red-and-white colors and angle of the C-pillar grabbed my attention. When I was a teenager, I thought 1960 Buicks had the ugliest fins GM ever sculpted into sheetmvetal, and the 225s were just ridiculously humungous road-going ocean vessels. But now, I think this black-painted and red-leathered car (Lot 490) looks like it would be great for cruising the boulevard or beach-front road. I have soft spots for station wagons and for Studebakers, so why not combine them and take home this 1957 Studebaker Provincial (Lot 227), an original black-plate California car in black and Rose Gold, and even with a 259-cubic-inch V8 engine? I was fortunate enough to visit Ron Pratte’s car collection and to see all these gas globes glowing gorgeously and hanging in precise rows from the ceiling. They’re being sold with his other automobilia at Barrett-Jackson. What I’d really like is just one of these, and converted into a table lamp.